A truly sweet ABC helper, just right for very small people. Alphabet letters plus cuddly pictures. Learn and smile. 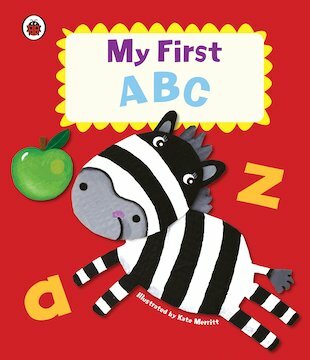 Made by the experts at Ladybird, this chunky board book shows you the letters of the alphabet in very cute pictures. You’ll learn each big and little letter using very simple examples like ‘apple’, ‘bird’ and ‘car’. (No tricky words in here.) Kate Merritt’s cheerful pictures make every page feel bright and happy. Perfect for sharing with a grown-up, reading in the playpen or snuggling up with at bedtime.